You love sugar, but it’s a heartbreaker (sniff, sniff). It’s quick rocket-fuel energy with a crash. These snacks give your body what it needs to quit your sweet addiction. You love sugar, but it’s a heartbreaker (sniff, sniff). It’s quick rocket-fuel energy with a crash. 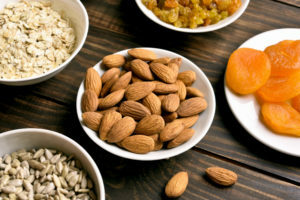 These snacks give your body what it needs to quit your sweet addiction, says dietitian Anna Taylor, MS, RD, LD, CDE. According to the American Heart Association, women should eat no more than 25g (6 tsp, or 100 cal) of sugar per day. Men should eat no more than 36g (9 tsp, 150 cal) per day. Carbohydrates (Digested + absorbed fastest). Protein (Digested + absorbed faster than fat, slower than carbohydrates). Fat (Digested + absorbed slowest). Combine at least two per snack to calm those sugar cravings, Ms. Taylor says. (Go for fiber-rich carbohydrates.) Also, include all three at every meal. Drinking a lot of water and eating regularly throughout the day will also keep your energy flowing. Watching your waistline? Make each snack 150 calories. Is Sugar-Free Candy the Best Choice If You Have Diabetes?